Given this focus it was odd that the original game did not allow one to play as any of the merchant republics. 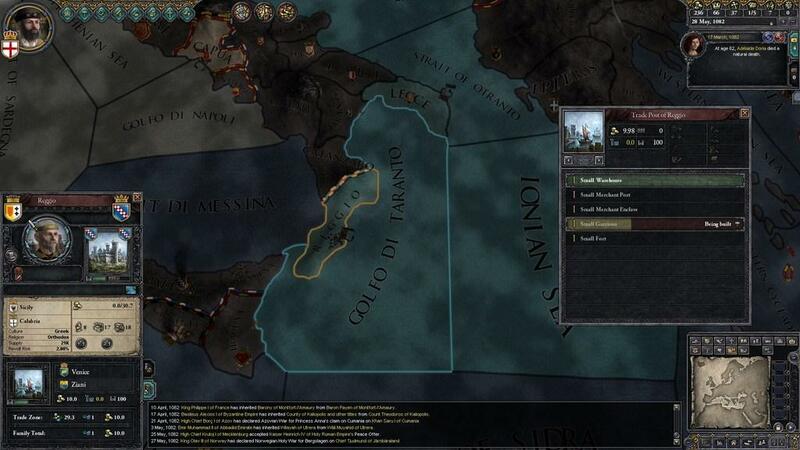 It is the aim of this expansion “Crusader Kings 2: The Republic” (CK2:R) to add these vital players to the game. These republics (especially Venice, Genoa, and Pisa) played a large role in the success and failure of the different Crusades. In particular, the republics provided two vital components every crusading army required: money and ships. The basis of most economies at the time (in particular, the economies simulated by CK2) was land. In particular, agricultural land, the people who worked it, and all the technologies of husbandry, warfare, and transportation that came along with it. This made for a static society where most warfare was based on attrition, whether in the field or at siege. The basis of the merchant republic economies, on the other hand, was trade. This made for a lot of travel by boat for long distances. Seaborne trade encourages different technologies: not just better boats, but navigation, governance, financial instruments, and naval warfare. Most of all it meant that the republics had a bunch of money. It may seem like this would be a good position to be in. You'll start off as the Doge of Venice and the money will just flow right in. 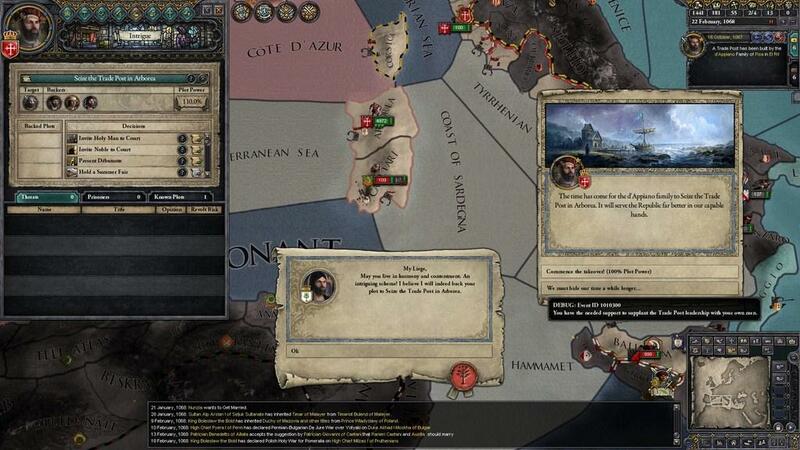 This is so much better than vanilla CK2, where there was never any money and you had to sit around forever before you'd saved up enough to build anything! As a bonus, rather than territories, your primary bases are trade posts. These are pretty resilient, weathering invasions and counter-invasions and making money the whole time. Turns out war can be good for business. The game starts out pretty well, then. You're bringing in a bunch of money, and spending it on building new trade posts to expand your trading empire. The more trade posts you have the more money comes in. This is great until one of your rivals steals a trade post from you. Every republic has a set of prominent families and it is these families that actually build/own the trade posts for that republic. If one family has enough money it can make a bid to steal a trade post from a rival family. This is just one facet of the internal politics of the republic. Although there is one “leader” who handles diplomacy, warfare and other nation-like things, each of the 5 or so rival families wants to have one of their number be the leader. When the current leader dies there is an election to determine who the next one will be. The most “successful” family wins, where success is a mix of longevity, trade posts, money spent on the election, and luck. Of course, you'd like your family to win. In a sense this nation-type has traded off succession crises for election crises. 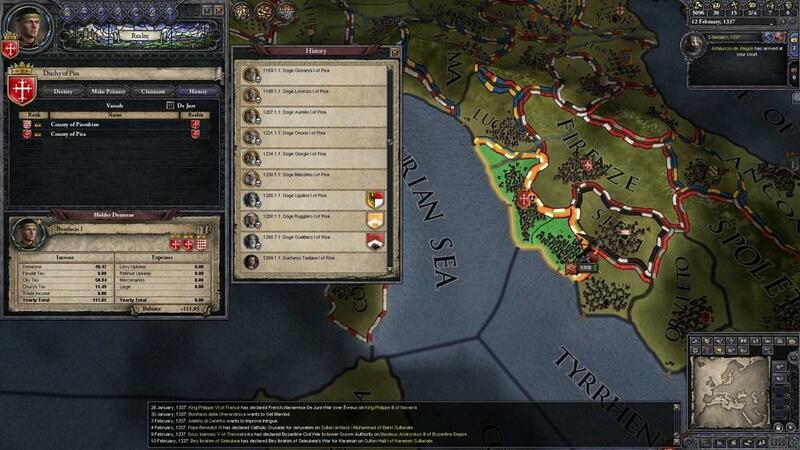 In CK2 it was always possible to buy off rivals by appointing them count of somewhere or having them killed, but that is not an option in CK2:R. The rival families are always there. You can kill a particularly popular rival, perhaps, or try to steal away a vital trade post, but there is no way to permanently remove this competition. You've traded constant war over land for constant inter-republic intrigue. 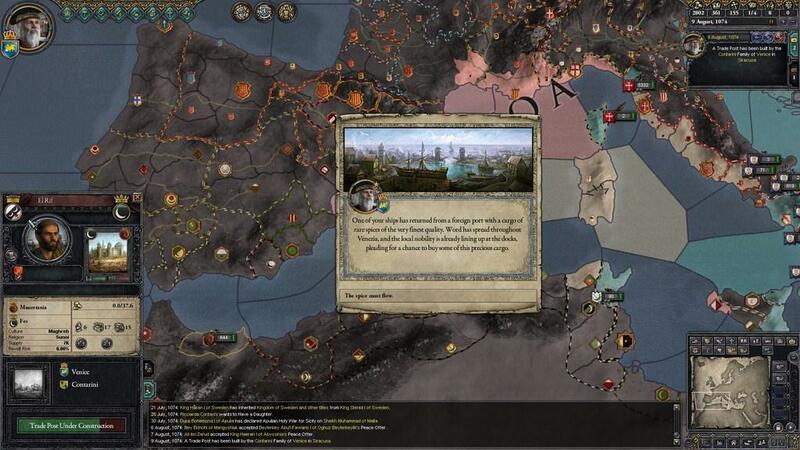 The defining characteristic of CK2, the constant scheming to get well-married, is still here. It''s not quite as important, given that what you really want is trade posts and not land, but it's still a good idea to keep friendly relations with the powerful, land-owning neighbors. Do well enough and you may even be able to get one to shut down the trade posts of your enemies through a trade embargo. This is a devastating move and will shut your enemy down for decades. Another benefit of being on good terms is that you don't have much in the way of armies. Sure, boats are nice, but when armies roll up to your ports, bad things can happen if you don't have your own head-bashers. You'll never have enough manpower to really make a dent against the land powers, so having one on your side is a good idea. Failing that, there are always mercenaries. As a republic you will (almost) always have more money than your enemies so will be able to hire more mercenaries. Mercenaries have their own problems, of course. They're expensive (especially in the long run) and maybe not quite that loyal. This goes to the heart of being a republic – you have a lot of money, but need to spend a lot of money to keep going. It's like being a capitalist surrounded by feudalists. 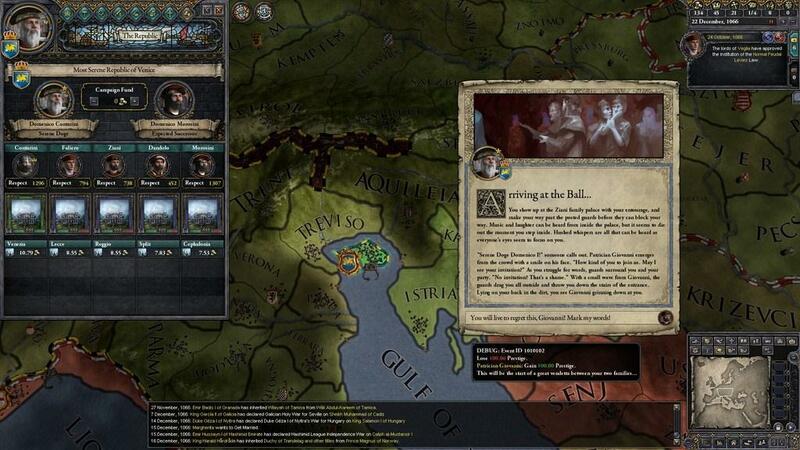 Which goes to the heart of the problem with CK2:R – it doesn't feel that well-integrated with the original game. 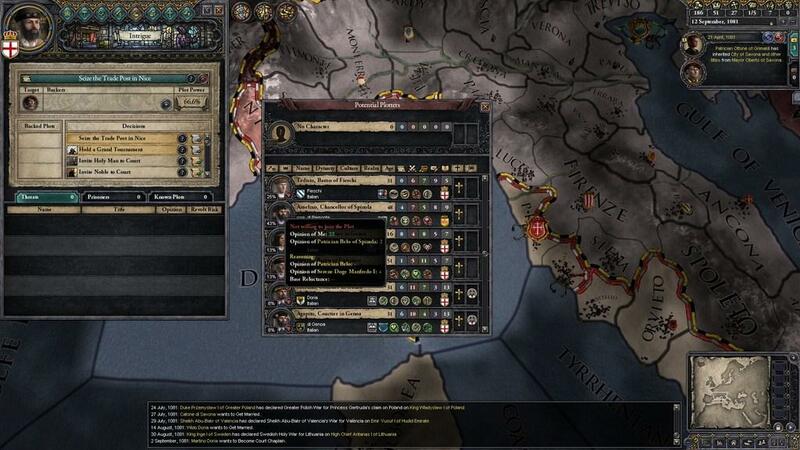 It was pretty clear what one wanted to do in CK2: stabilize your kingdom, marry your bloodline into successful families, expand your territory, and put relatives into positions of power. CK2:R plays differently: you spend a lot of time setting up trade routes, building/upgrading trade posts, and inter-republic intrigue. It can feel almost as if the rest of the world is playing a different game. It's not that being a republic is a bad way to play the game, it's just different. Some more work could have been done to integrate the two playing styles into the same world. It can feel like the grand sweep of history is something that's going on without you, that your republic is just making money off what's going on rather than taking part in it. If you're the kind of gamer who is interested in building an empire without the constant blood-and-guts warfare of the Crusading era this is a welcome option. If you prefer a more hands-on role, the standard nations are still there. 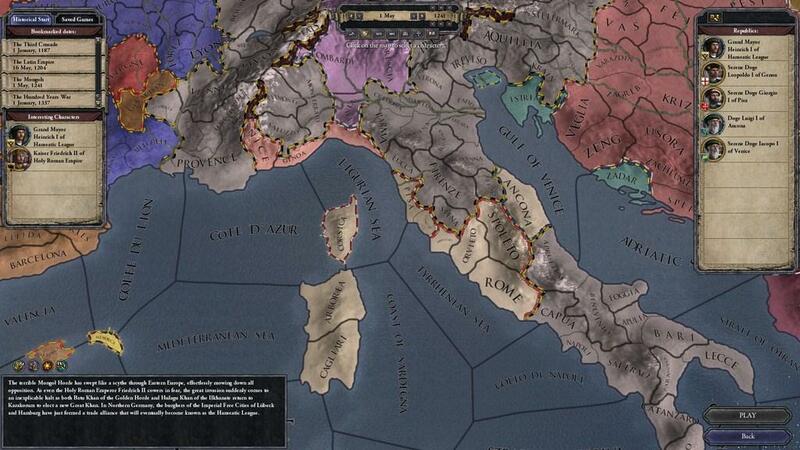 In summary, “Crusader Kings 2: The Republic” adds a host of new game mechanics to the original in order to reflect the unique situation trading republics found themselves in during the Crusades. These new mechanics do a good job of making republics different and interesting to play, but do not integrate as well as might be desired with the original game. 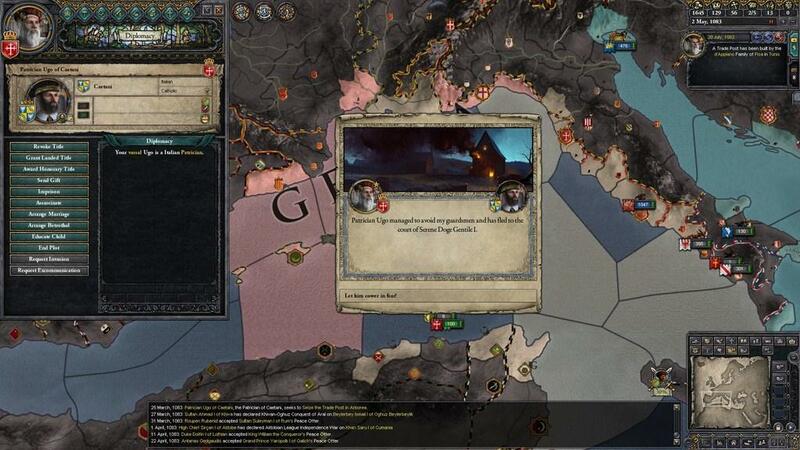 CK2 is gaining a devoted following for its atmosphere and depth of gameplay. This expansion adds to both, so is a welcome addition. 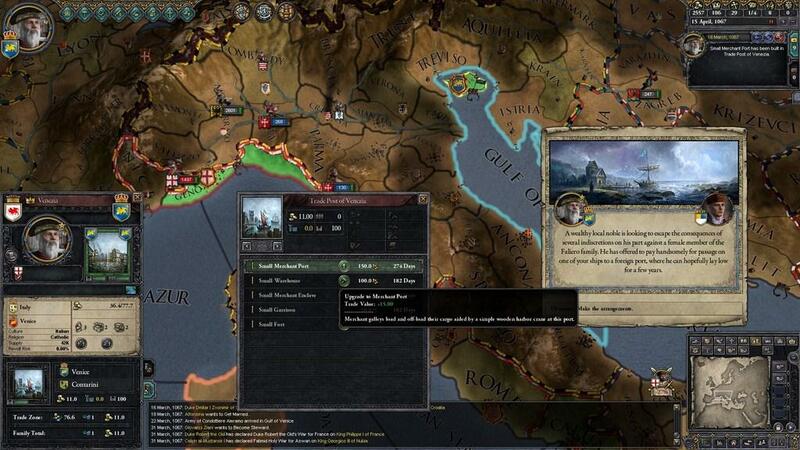 If you like CK2, you'll be well-served spending the 10 bucks this expansion costs.